RESISTANCE would have been futile; Volkswagen knows that. Practicality and solid sensibility with just a dash of flair was enough to sell the previous two generations of Touareg but now the world has changed. With the large sports utility scene not only sizzling but also stacked for choice, a model that has hitherto striven to be classy (in sharing the underpinning with sophisticated luxury SUVs) while contriving to impress as being more tangibly working class than its Audi, Porsche and now Bentley and Lamborghini blood-shares, has had to lift its game. Sharpen, smarten, gain extra shine. Join ‘the club’. And how’s that gone? Quite well, all in all. There’s still obvious distinction between the just-arriving new generation Touareg and the DNA-linked Q7, Cayenne, Bentayga and Urus that have all preceded it to market, but mainly now in price. Yet, at the same token, there’s no argument that VW’s offer has far more presence and more genuine prestige through steering more directly toward Luxury-land. That it initially provisions purely with a 3.0-litre V6 turbodiesel that would be considered the entry choice in those other family brands is perhaps the only obvious sign of restraint. The eye-catching – if not wholly genuinely attractive - chrome-heavy front end is the first stop for your gaze. Behind that there’s more to impress. The body is an exercise in tasteful, on-trend design, featuring sharper lines than before and more creases in the sheet metal, but also conspiring to downsize the overall bulk. Then there’s a powertrain that creates 170kW/500Nm in entry spec and 210kW/600Nm in a more upmarket format. 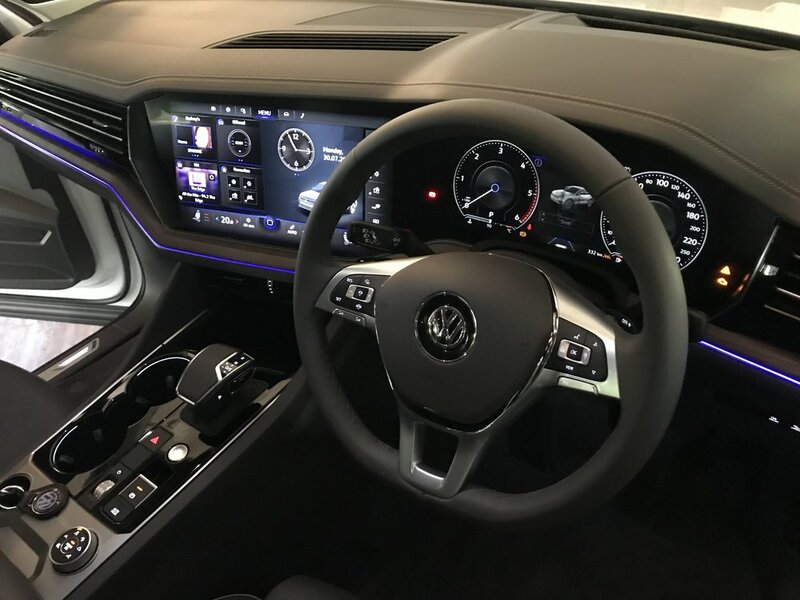 An interior that affords not just more occupant and luggage space – though that 810 litre (16 percent larger) compartment is still not enough to allow VW to consider meeting the overwhelming market call for seven seats – but is also massively more affluent in look and feel. Beyond that, lashings of technology. Also, improvement in driving demeanour. These are all core elements leaving clear impression that the ‘people’s car’ product is less proletariat, now. At what price? Yes, well, that’s the curly question. On initial examination, this new Touareg seems to have come through its cultural transformation with very little pain. The announced stickers of $92,990 for the base 170kW and $107,990 for the more fulsomely-rigged 210kW are respectively just $3000 and $4000 more than the full retails VW New Zealand sought for the like-capacity outgoing equivalents. However, those are base prices, before options are considered. As they must unavoidably be. 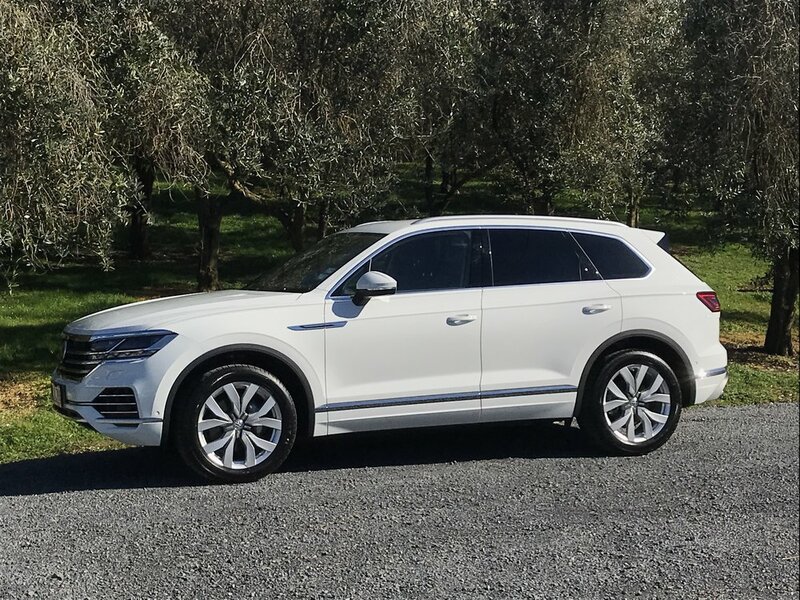 From a first taste drive, it’s abundantly clear that if you desire a Touareg that is fully up to strength with the best assists and comforts the factory has to offer then those starter prices stand to be enhanced considerably. Basically, too, they should consider starting at the top, too. While the distributor has standardised leather, keyless locking and start, an alarm and included a strong safety schedule - beyond the ABS, ESP and airbag usuals, ours take pedestrian monitoring, proactive occupant protection, forward collision warning, adaptive cruise control with traffic jam and emergency assists, side assist (lane-keeping, lane assist and rear traffic alert), a drive rest prompt and a tyre pressure monitoring system, all of which bode well for a yet-to-be-delivered ANCAP score – the sales strategy puts the 210kW model in the box seat. For a start, this edition alone provisions from the box the singlemost impressive feature, the Innovision Cockpit - what appears to be one huge glass display consisting of a 12-inch screen for the instrument cluster and a whopping 15-inch touchscreen for the infotainment and navigation obligations. It looks expensive and really is for those who want it in the entry model. Upgrading from the analogue displays is a $6500 hit on that car. But that’s only giving you half the best package. You’ll surely want, also, to opt away from standard coil springs for a version of the air suspension. That’s only possible with the dearer car. The system comes in two packages. A $6000 starter with Dynamic Car Control, driving profile selection and rear-wheel steering or the full-out $10,000 format that has all that and adds in active roll stabilisation operated by 48-volt electronics, the same set-up that involves with the Q7 and Bentley. The flagship’s head up display and LED matrix headlamps can be added to the starter model for $2200 and $6000 respectively. A schmantzy night vision thermal imaging set-up that ties with the latter lighting and uses an infra-red camera to reveal animals and humans (rather than simply heat-producing objects) up to 130 metres ahead is reserved as a flagship enhancement, adding $3000. Likewise, while both editions can be furnished with a tilt/slide sunroof for $3000, a thumper Dynaudio sound system upgrade for $3000, and a net partition for $750. The more expensive car alone offers choice to update to ambient lighting, for $750. So, in short, there’s plenty of opportunity to glam up the base packages, as evidenced by the example featured for this first drive. Delivered here early for a dealership roadshow that precedes the arrival of the first full shipment, our drive car had the 210kW engine, the big screens and a head-up display, but also the standard coil suspension and a different quality of leather that will avail here. From, the strength of our run, the big question with this car will be what suspension to choose. The priciest air set-up especially simply has to make a huge difference to how a car cited as having a 2070kg kerb weight rides and corners. On its most basic set-up, and with four adults aboard, the Touareg is not too bad. But it’s also like those before in not being too bothered by the ‘sports’ part of SUV. Yes, it seems to track with tenacity and the 255/40 R20 rubber is serious in its grip, but cornering roll was obvious enough on the rural roads we experienced to keep our pace to a relatively relaxed level. On the plus side, it did a good job soaking up ruts and undulations, a trait which, again, maintains an established modus. All good, yet there’s every chance those desiring something excitingly new – that is, a Touareg that minimises jostle and keeps tight and leans less in the turns - then the up-spend to the full-blown adaptive anti-roll and that rear-steer is very probably necessary. The forte of the intermediate air suspension, meantime, will likely reveal with heavy haulage trailering and when off-roading, as it’ll also jack the car up for better off-road clearance and, like the most expensive system, hunker it for 120kmh-plus driving. However, it’s kitted in that respect, the drivetrain will appeal. The gruntiest version of this engine has the bigger power enhancement over its predecessor – a lift of 30kW (against 20kW), but both editions deliver 50Nm more torque than their respective former formats. The extra oomph channels through a fresh fly-by-wire eight-speed transmission and is enhanced by the Touareg being on a new platform that, with significantly more aluminium and lighter steels, is up to 106kg lighter than before despite being stronger and bigger in every dimension. The engine is a renewed version of the previous mill, redesigned not just to deliver extra pep but also to meet Euro 6 emissions rules (through AdBlue exhaust fluid injection) and improve economy to a cited 6.6-litres per 100km overall. It’s a step up in respect to its muscularity, if not wholly for refinement, in that it’s smooth and quiet when you’re using it gently, but still evidences an intrusive gruffness when given heavily booted. For those who want more, VW has already arranged for the model to adopt the Audi SQ7’s 320kW/900Nm V8, from this time next year, yet that’s not to suggest the six isn’t a good enough go-to already. It steps off smartly, has plenty of readily available urge for overtaking and doesn’t seem to run out of steam when hurried into speeds that cannot be legally countenanced. The launch variants are rated to tow 3.5 tonnes without raising a sweat. Going off-road? With just two cars in-country, VW wasn’t going to risk any chance of blemishes, so whereas the launch of the previous car was fully immersive (in rivers, snow, mud and the like) this time the only non-seal moment was to photograph the car above a beach. For the record, the Touareg offers as standard a 500mm wade depth, rising to 580mm with that air suspension, which has an 80mm (extra) off-road height setting. The factory has created an off-road pack that adds underbody protection plates, tow eyes and a 90-litre fuel tank. It has separate traction-and-powertrain modes for snow, gravel and sand. No low box though. Discussing the new cabin is saving the best for last. Rendered in high definition, the Innovision displays are beautifully crisp and clever design means the two screen panels appear as one to the driver, the join having been hidden by the wheel rim. The central, infotainment-biased screen is highly configurable and also has a slightly matt finish, to help reduce the usual profusion of fingerprints. The operating system takes a bit of getting used to; the brand had a staffer ride with his to explain the shortcuts and the series of mini-tiles that are implemented because the screen is so huge. Mostly the display is uncluttered because the virtual buttons appear only when a proximity sensor sees your finger approaching. But you learn that touches are single digit, swipes take two fingers together and various gestures will enable various outcomes … though we didn’t get into those. With the while dash being behind glass, it looks like the centre air vents have been relegated to a position where they can aim at your lower parts – but, wait, there’s a diffusing grille neatly implemented into the dash top. The system has four USBs, a wireless hotspot, and inductive charging mat. You’ve all the usual choice of inputs – USB, CarPlay, Android, Bluetooth, DAB, radio, SD card. As for the general ambience? The mood lighting is a worth having and it’s nice to see VW has quit past preference for grey on grey. Finish depends on what specification grade you go for – the car I drove achieving darker materials than will be standard – and some of the materials around the lower dash feel ordinary, but the overall atmosphere is less stark and more affluent than it previously was. The obvious disadvantage a Touareg incurs is that it continues to be purely a five-seater whereas main rivals can often offer a five-plus-two or full seven-seat setup. The VW approach certainly benefits rear legroom and affords decent boot space before you start folding the rear seats down (or using the underfloor compartment), but will that sell it? Fact is, there’s a sense that, with a third row, this car might easily have become a better bet than the brand’s sole seven-seat SUV, the next-size-down Tiguan Allspace, if not necessarily for length then definitely for width and head-room. But it ain’t happening, so enjoy instead a mega-hatch whose rear head- and legroom are generous, with only the wide transmission tunnel encroaching on mid-seater’s foot room. It’s good that the front seats are real thrones, the test car’s having massage function and electrically powered adjustable side bolsters for the cushions and backrest independently (all controlled by a series of animated graphical menus on the big central screen), because the car has a richer approach. It’s a pity that the stickers have to be considered starter prices, but even without having seen one, logic suggests an unembellished Touareg would be somewhat less alluring than the car I experienced. Even as is, the basic coil-sprung chassis lacks the final polish you now get from some many rivals. On the plus side, a Touareg with all the kit will still cost a lot less than a Q7 with the same level of enhancement, so if five seats are fine, it is potentially now the smarter choice.